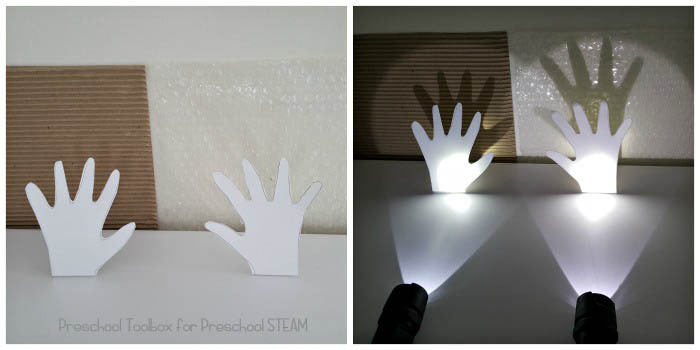 This is a fun STEAM activity for preschoolers explores how shadows are made indoors. Outside, our shadows are easy to see in the sunlight. They are fun to chase and to jump on, to move around, or to freeze in place. But without sunlight, how can we see shadows indoors? 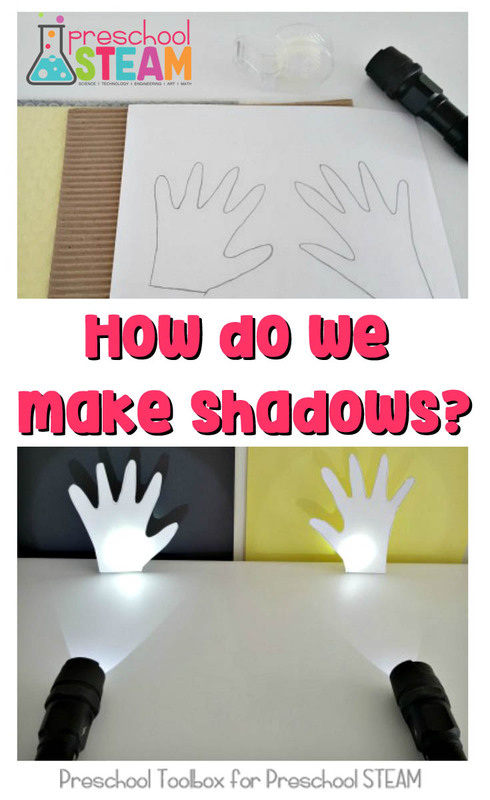 Shadows are easy to create and fun to explore in this simple shadow activity. Ask: How can you make a shadow indoors? What surface is best for revealing your shadow? Make a hypothesis: Shadows will be easiest to see inside on a wall or light colored surface. 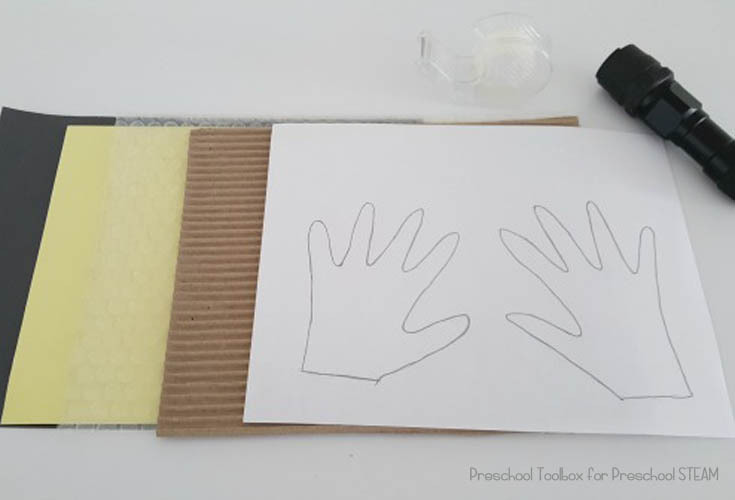 Experiment: Trace hands with wrists on plain paper. Cut out. Bend back at the wrist and place the hands on a table in front of a wall. You may have to tape the cutouts to the table to support them. Shine a light source on the object. Observe the shadows on the wall. Repeat the experiment with textured papers such as corrugated paper and bubble wrap. Repeat the experiment with light and dark colored paper. Observation: Is one surface better than another for revealing the shadow? Does the shadow change in appearance from one surface to another (does it become blurrier/darker/lighter/clearer)? Conclusion: Natural light from windows revealed a faint shadow, but shadows were stronger with an added light source (flashlight). Shadows don’t rely on the backdrop as much as the light source, but shadows appeared slightly darker on the dark paper and on the corrugated cardboard. 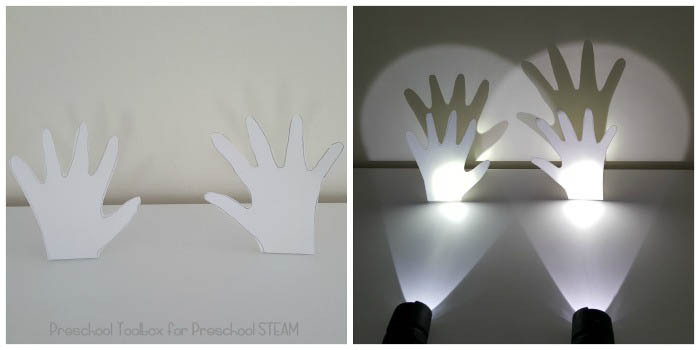 Seeing variations in how shadows are made is easy with this STEAM activity. 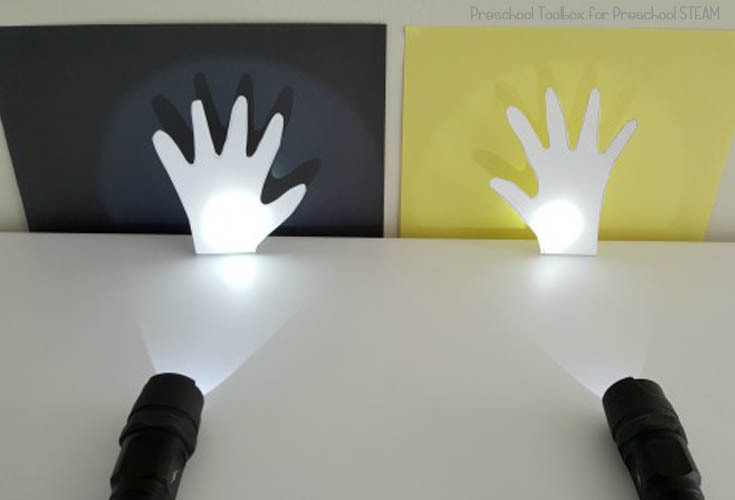 Kids love making shadows with a flashlight, so providing a few simple hands-on materials adds observation and discovery to their play!